Nichol Marine has been providing marine construction and repair services to Vancouver Island for over nine years. 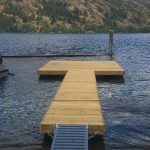 We specialize in residential and commercial marine contracting, including docks, aluminum ramps, approaches, boardwalks, floatation systems, boathouses, and full electrical services. We are a locally owned and operated company with over 25 years experience in the marine industry. No matter what your marine need is, we are your number one company to get the job done. Our breadth of experience as a dock and marine contractor is second to none on the island. We can handle projects of any size or type, ensuring your lakefront or oceanfront construction project goes smoothly. The Nichol Marine team puts customers first, and we take tremendous pride in the quality of all our projects. In addition to standard construction services, we have an electrical contractor division Nichol Electric, that is fully equipped to handle all types of marine electrical repairs or servicing.